ROAD TOWN, Tortola, VI - Leader of the Opposition Honourable Andrew A. Fahie (R1) has expressed deep frustration at the constantly delayed reopening of the Soper’s Hole West End Ferry Jetty. The Jetty, is still inaccessible by United States Virgin Islands (USVI) ferries coming to and from the territory even as the matter was raised several times in the past and just recently at the question and answer segment of the December 13, 2018, sitting of the Virgin Islands House of Assembly (HaA). Honourable Mark H. Vanterpool (R4) in response said the facility will be completed by the end of January 2019. 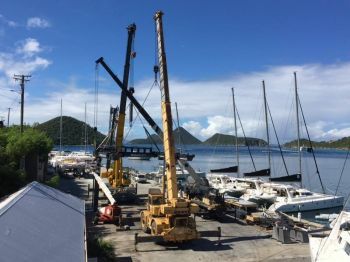 “[It] is the latest report I have had from the BVI Port Authority,” he said, “And we will be pushing to have that happen by the end of January 2019,” Mr Vanterpool told the House. Hon. Fahie remarked, “My spirit grieves,” due to the bombardment he faces from members of the First District as to when exactly the facility will be reopened. This is the fourth date of completion given in the HoA following the passages of Hurricanes Irma and Maria of 2017. Defending the dates previously given, Hon Vanterpool said the missed October deadline was for a temporary building along with a security fence to meet international standards. “We have not met that October date,” he said, “in fact, the Port Authority made some adjustments to what was planned before and now they are going out to get a temporary building built,” Mr Vanterpool told the House. The Works Minister noted that that rest of the Project is in design phase and will be presented to the public when it is ready, “However, a temporary structure is intended to [be] put up there Madam Speaker, within the next six weeks,” he assured. Hon Fahie was not satisfied with the explanation, he cited that the Jetty was the second largest revenue generator for Ports and Customs in the territory and called for action, “Madam Speaker somebody… needs to be fired!” he stressed. According to Hon Fahie, “We are contributing to companies going bankrupt and I have been here fighting… every time I hear the date shift,” he said. The access road to the Jetty is also in a deplorable state and Hon Fahie sought answers as to when the damaged parts of the West End road would be resurfaced. “They put a chair in the hole to ensure that you don’t drive in the hole... There is a chair in the hole and Madam Speaker, when you attempt to go [to] Carrot Bay, there are some holes so huge that depending on what size car you in, they wouldn’t see you when you go done until you get back up… that’s not even exaggerating,” the Opposition Leader told the House. The Works Minister said other road works in the area will also be completed in promising ‘urgent interventions’ as he shared in the frustrations highlighted by Hon Fahie. Now's the right time build a proper terminal across from the police station. Fahie is 100% correct. The NDP should be ashamed. Mark and his NDP gang doesn't care about the west end ports facility. They cares nothing about the 1st district. @Hmm..They care nothing about nothing. None of them need to be representing people or territory. 2 jokers in the Marine Dept. fire them 2. The manager don’t know one thing bout the Marine employees, ask he a question bout how much hours the Marine Officers working and he can’t answer. Lame leadership. And the other one just taking orders from the manager and passing it on to the Marine employees and don’t even stay or be with the employees most of the time to over see what they’re doing. All he wan do is talk to a woman on the phone all day. The Port need a real shaking up and people need get fired. We need some real leaders in these important positions at the port. At Sean k& Romeo: We need real leaders in all leadership positions, not just the port. The neglect of the West End Port by the NDP is flat out EVIL!! !